Let David LeRoy Plumbing, Heating and Cooling match you with the best heating system for your home. For improved energy-efficiency, ductless mini-systems are perfect for setting up zone control in your home, meaning you can heat certain rooms in your home. These units have two parts — one outside compressor and an indoor air handler. Is your heating system older and not properly heating your home anymore or needing frequent repairs? Our certified and trained installation professionals can assist you in selecting a new heating system based on your family’s needs and budget. We specialize in installing geothermal heat pumps, oil and gas furnaces, ductless mini-splits and boilers. With a wide range of energy-efficient options, we guarantee you’ll experience improved comfort with added temperature control and zone heating. More Pennsylvania homeowners are switching to a heat pump system because of their added efficiency. You can heat and cool your home more efficiently than fossil fuels since you are transferring the air, rather than by burning a fuel. There are two types of heat pumps you can install in your home — a geothermal pump, which draws heat into your home from the ground, and a conventional heat pump that can draw warm air into your home from the outside. At David LeRoy Plumbing, our technicians are among the few who are trained and have the required expertise to properly install and maintain your new heat pump. Oil and gas-powered furnaces are among the most common used by Pennsylvania homeowners to heat their homes during the winter. Furnaces work by transporting warm air through ducts in your house, powered by either gas or electricity. 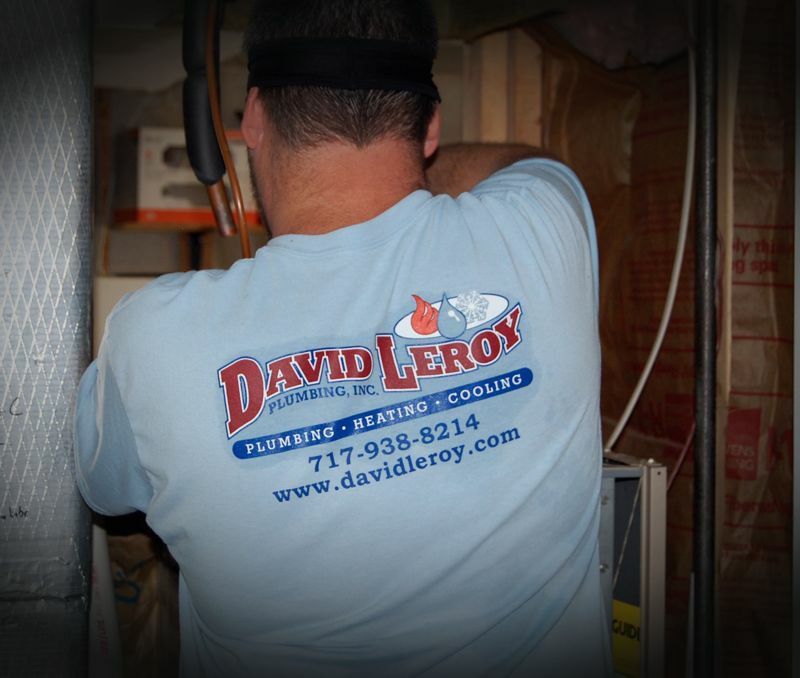 At David LeRoy Plumbing, we can recommend a new furnace based on your budget or make any repairs to your current unit. Ask us about improving your furnace’s energy-efficiency — we can measure heat flow to ensure your heat is being delivered as effectively as possible. Like furnaces, boilers are very common in Pennsylvania homes. Only unlike furnaces, boilers heat water and transport that water using a radiant floor system, baseboard radiators or pipe. Work with one of our technicians to choose a boiler that works best for your home and will last for years. At David LeRoy Plumbing, we specialize in heating installation throughout York and want to provide the most affordable options to increase the energy-efficiency in your home, lower monthly heating costs and improve your family’s comfort. When you work with David LeRoy Plumbing, you can be confident that our heating installation is in the hands of our experienced, certified technicians. Each of our technicians is locally hired and trained to get the job done right and understand the heating needs of Pennsylvania residents, all while providing excellent service and dependability that you can count on. As soon as you call David LeRoy Plumbing, we will get started on an estimate for your heating installation or recommend products and services that best fit your family’s needs and budget. We’ll assess your home to help determine what best works for you, then provide an estimate that is competitive and transparent — we want you to understand exactly how our pricing works and what goes into each estimate that we provide. For new unit installations, our heating technicians will arrive on the day of installation to walk you through the process. When it’s time to get started, we encourage you to sit back and relax – we’ve got it covered! As soon as the installation is complete, we’ll walk through our advice for care and maintenance of your new heating system, so your heating component will last for years to come. We’re so confident in our installation abilities that we even offer a two-year warranty on workmanship. If you ever find yourself without proper heating, our technicians are always available 24 hours per day to repair your system so you’re never chilly for long. For 20 years as of 2018, David LeRoy Plumbing has installed and maintained heating systems, including gas and oil furnaces, heat pumps and boilers. We’re a family-owned and operated company specializing in helping Central PA residents including York and Harrisburg with their heating needs, achieving more energy-efficiency that reduces annual utility costs and improves your family’s comfort. We understand how important it is to have friendly and trustworthy local technicians perform maintenance in your home and know your unique heating needs. For our customers’ convenience, we also offer 24-hour emergency services, a two-year warranty on all our workmanship and fantastic warranties on new heating and cooling equipment. We also offer financing options for new equipment installations. For cost-effective, dependable heating installation, call David LeRoy Plumbing today at 717-938-8214 or fill out our online form to provide information and request your free estimate. We look forward to providing your home with heating that you can count on!